Brent oil prices decreased by 1.86 % or US$1.47, as prices fell this week. Oil traded on May 31, 2018 at a price of $77.72 per barrel relative to US$79.19 last week. Brent oil began the year at US$68.07 per barrel. 87 Octane prices increased week over week, by 0.25% (JMD$0.33). Additionally 90 Octane rosel by 0.24% or (JMD$0.33) week over week. 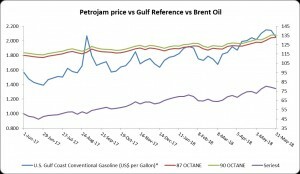 87 Octane and 90 Octane opened the year at J$121.04 and J$123.88 respectively and now trades at J$132.95 and J$135.79 per litre respectively.